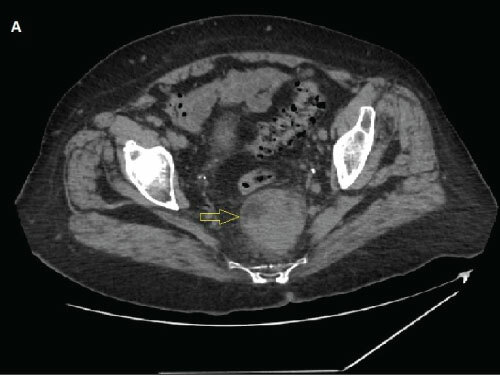 A 76-year-old woman underwent abdominal CT (Figure 1) to explore anemia and fatigue after negative results from upper and lower GI endoscopy. CT scan showed a large heterogeneous pre-sacral mass with a long axis of 60 mm. At digital rectal examination a solid mass was palpable from the posterior rectal wall. 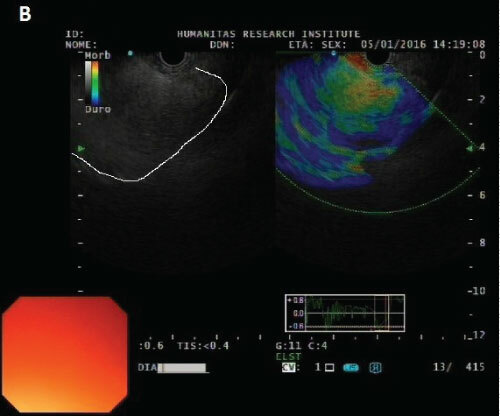 At rectal endoscopic ultrasound (EUS), the mass showed an intense hyperechoic in homogeneous echotexture, with hypovascularization and with a soft pattern at elastography (Figure 2). This mass was located in the presacral space without involvement of the rectal wall. The hyperechogenicity of the lesion made it difficult to distinguish its borders from the perirectal fat (Figure 2, white line). An EUS-biopsy was performed using a 25 G Sharkcore needle (Medtronic, Boston, MA). The mass was so hyperechoic that the needle was hardly recognizable inside it. The digital palpation done before the EUS was an adjunctive tool to the EUS guidance to confirm where the needle had to be addressed. The specimen obtained was a microfragment that was collected into formalin and processed as an histological specimen. 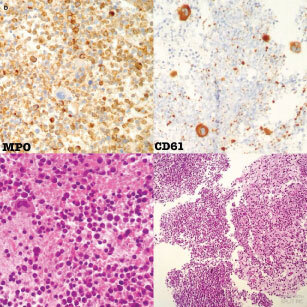 Immunohistochemistry with MPO and CD61 applied to the histological findings made the diagnosis of extramedullary hematopoiesis (Figure 3). I, Dr. Carrara, the corresponding author, accept full responsibility for the conduct of the study. Dr. Carrara performed the endoscopic ultrasound and wrote the manuscript. She has approved the final draft submitted. Dr. Rahal read the histological specimen. He has approved the final draft submitted. Dr. Di Leo and Dr. Fugazza reviewed the images and prepared the figures. They have approved the final draft submitted. Prof. Repici reviewed the manuscript. He has approved the final draft submitted. 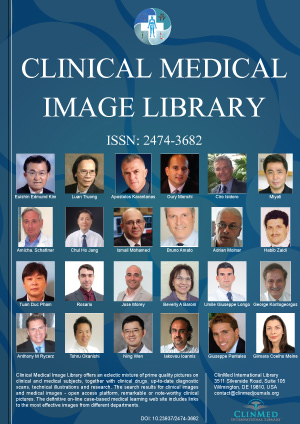 The Authors declare no financial relationships with a commercial entity producing health-care related products and/or services relevant to this paper. No funding sources were used. Figure 1: CT scan of a pre-sacral mass. Figure 2: EUS appearance of rectal mass. Figure 3: Immunohistochemistry MPO and CD61, specimen stained with hematoxylin and eosin. Silvia Carrara, Digestive Endoscopy Unit, Division of Gastroenterology, Humanitas Research Hospital, Via Manzoni 56, 20089 Rozzano, Milano, Italy, Tel: +39-02-82247288. © 2019 Carrara S, et al. This is an open-access content distributed under the terms of the Creative Commons Attribution License, which permits unrestricted use, distribution, and reproduction in any medium, provided the original author and source are credited.